Imagine a place where lobster is a common lunch fare, traffic lights don't exist and you can hail a taxi on the water. 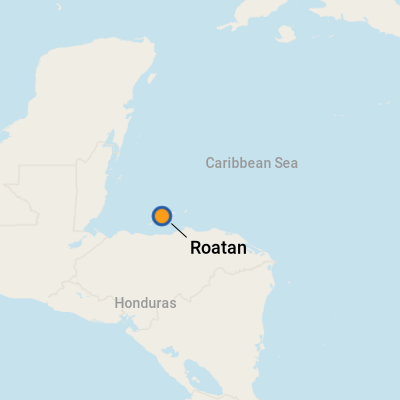 Welcome to Roatan, the largest of the Bay Islands, 30 miles north of Honduras. Almost 40 miles long and just 2.5 miles at its widest point, the remote island boasts white-sand beaches, pristine bays and spectacular coral reefs. Roatan is a true melting pot. Its 50,000 people are a mix of Spanish, British, Paya Indian and African, the result of a stormy history that includes conquistadors, pirates and slave traders. 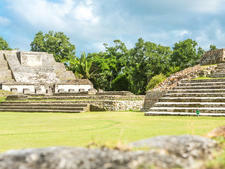 In the mid-17th century, the Spanish relocated the Paya Indians in an unsuccessful attempt to rid the island of British pirates. In the late-18th century, the island was repopulated when British troops deported thousands of Black Caribs who had sided with the French during a battle over St. Vincent. Another group of immigrants arrived from the Caymans in the 1830s. Today, tourism has overtaken commercial fishing as Roatan's top industry. Part of the world's second-largest barrier reef system, Roatan's waters are teeming with colorful coral and sponges. 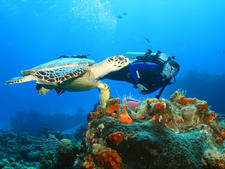 Divers and snorkelers swim alongside schools of fish, as well as whale sharks, barracudas, mantas, dolphins and turtles. The water feels like what you'd find in a bathtub, hovering around 80 degrees Fahrenheit, and snorkeling there is like watching high-definition television, with fantastic visibility. Dozens of world-class diving and snorkeling sites are accessible from sandy white beaches around the island and through numerous operators congregated on West End Village, the hub of the island's activity. Marlin, tuna and wahoo lure anglers year-round, particularly for the annual fall bill-fishing tournament. Roatan is also a mecca for water sports. Kayaking, water skiing, sailing and wakeboarding are popular activities. The former pirate haven offers travelers unspoiled charm and exceptional marine life. Like many of its Caribbean neighbors, the island is in transition. Expensive new homes and resorts stand in sharp contrast to clapboard tin-roofed houses. In addition to cruise ships, direct flights from Miami and Houston and weekly charters from Milan are bringing large numbers of tourists. If you venture out on your own, know where you're going, and get comfortable saying "no"
Coxen Hole: The largest city and capital of the Bay Islands, Coxen Hole is located just west of the airport. This busy gateway is named after the pirate John Coxen. Besides internet access, an ATM, a small shopping mall and a handful of restaurants, there's little for tourists. It's a good place to buy cold drinks and sandwiches before venturing east toward French Harbour and Oak Ridge, and west toward Sandy Bay and the West End. You can also easily walk past the port gates onto the local streets, where you'll find authentic food and souvenirs. Mahogany Bay: Mahogany Bay, a 20-acre $62-million Carnival-sponsored area specifically for cruise passengers, opened in 2009. It's located just east of the airport, and it has room for two ships. Just off the pier, you'll find a strip mall-type central plaza, featuring souvenir shops, restaurants, a general store, jewelry kiosks, shore excursion information, car rentals, an ATM and, often, live music. There's also a chairlift that will give visitors unlimited rides to and from Mahogany Beach -- a nearby 10-acre private beach -- for $5 per day. Coxen Hole: If you travel beyond the immediate port area, be prepared to deal with pushy locals -- sometimes children -- who will offer everything from cab rides and excursions to local wares. You might also be asked for money by locals who try to force their tour guide services on you, even if you haven't asked for them. It's important to know where you're headed before venturing out on your own; two young children told us that certain bars along the main street, just outside the port area, are actually brothels in disguise. Mahogany Bay: The whole setup is a bit of a tourist trap. If you decide to explore elsewhere and want to rent a car, be warned that the roads tend to be narrow, and traffic lights are basically nonexistant. As you would in any unfamiliar place, keep all unnecessary valuables onboard in your cabin's safe. A paved road runs north from Coxen Hole to West End and east to French Harbour. An unpaved road continues east to Paya Bay and Camp Bay. Taxis, rental cars, motorbikes and buses are available in West End, Coxen Hole and French Harbour. By Rental Car: Captain Van's (+504-2445-5040) in West End rents vans, mountain bikes and scooters. Caribbean Rent a Car is located along the main road near French Harbour (813-506-8663). A car rental booth is also available off the main plaza in Mahogany Bay. By Taxi: Some unscrupulous cab drivers have taken advantage of cruise passengers. Before entering a taxi, confirm the fare. If the driver says 20, make sure he's quoting lempiras, not dollars. Most cabbies accept both U.S. dollars and lempiras. By Bus: Mini-buses run in either direction from Coxen Hole. Flag down a bus, and pay the driver's assistant -- about one U.S. dollar on most routes. The official currency is the lempira (named for a martyr who fought the Spanish). U.S. dollars are widely accepted, as are credit cards and traveler's checks. In Coxen Hole, BAC Credomatic provides cash advances on credit cards and features a 24-hour ATM. (located on the main street in Coxen Hole; +504-2445-1196; open Monday through Friday, 9 a.m. to 5 p.m., and Saturday, 9 a.m. to noon) An ATM is also available at Mahogany Bay in the center of the main plaza. For the most up-to-date conversion rates, check out www.xe.com. Though Spanish is the official language of Honduras, most people on Roatan speak both Spanish and English. Editor's Note: Addresses in Roatan do not exist the way we know them. We've included pertinent location information; locals and cabbies will be able to point the way. One of the best drinks on the island is Salva Vida, a famed local beer. It can be found at just about any bar or restaurant. If you're not the beer-drinking type, pina coladas are always a sure bet. Dale's Restaurant: Located along the water on the road from Coxen Hole to Little French Cay, Dale's Restaurant specializes in Honduran food, buffet style. Fruit Carts: Just outside the Coxen Hole port gates, you'll find local vendors who drive by with fruit carts. Try fresh, sweet slices of local pineapple for just a dollar or two. 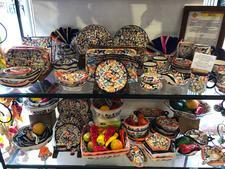 Locally made handicrafts are great souvenirs. You can pick them up at stalls located throughout the areas surrounding port. You'll find everything from clothing and jewelry to cigars and chocolate -- all at decent prices. In Coxen Hole, the most authentic offerings can be found if you head beyond the immediate port area, which is a bit more commercialized. Don't worry: It's easily walkable.